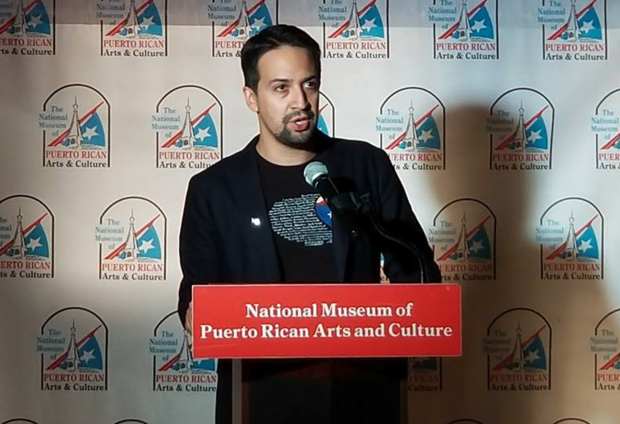 "Hamilton" playwright Lin-Manuel Miranda appears at the National Museum of Puerto Rican Arts and Culture, 3015 W. Division St., to promote assistance for the island. HUMBOLDT PARK — "Hamilton" creator Lin-Manuel Miranda was in Chicago Wednesday touting his "Almost Like Praying" song as a way to raise funds to help Puerto Rico recover from Hurricane Irma. "Feel free to stream it and bump it in your car. But if you buy it, all the money will go to the Hispanic Federation" for hurricane relief, Miranda said at the National Museum of Puerto Rican Arts and Culture, 3015 W. Division St. The song, which includes pop stars with Puerto Rican connections, includes the names of 78 cities in the territory. The trick was to include the names "and still make you want to dance to it and buy it." Click here to buy the song, priced at $1.29 on iTunes. The song was inspired by "Maria" from "West Side Story" and begins, "Say it loud and there's music playing/ Say it soft and it's almost like praying." He has described the song, which he wrote very early one morning, as a "love letter" to Puerto Rico. It was recorded in less than a week and includes Marc Anthony, Ruben Blades, Gloria Estefan, John Leguizamo, Jennifer Lopez and Rita Moreno. In Chicago, Miranda described himself as "a private citizen who has a big Twitter feed" but said that his "new gig" was assisting Puerto Rico. "Thank you for keeping Puerto Rico in your thoughts and prayers, and hopefully, responding with your wallets, or your supplies or however possible," he said. Much of the island is still without power, and many still have no running water since the September hurricane, he said: "We're far from done here." The entertainer, who has criticized the Trump administration's response to the hurricane, called for "transparency" in how government assistance to rebuild Puerto Rico will be used. He was apparently referring to a controversial $300 million contract to rebuild the island's power grid that was awarded to a U.S. firm with only two employees. That contract was canceled in the wake of Washington Post reports that the company had connections to U.S. Interior Secretary Ryan Zinke. Miranda was born in New York but included himself in what he called "the diaspora" of Americans with Puerto Rican ties.